Fredericksburg, VA---Fredericksburg Baseball is excited to announce the unveiling of the Founders Club for the organization's inaugural 2020 season in Fredericksburg, VA. The Founders Club membership guarantees fans the ability to select their seat at the team's state of the art new stadium facility to be located in Celebrate Virginia South. This once in a lifetime opportunity allows fans to celebrate baseball in The 'Burg and lock in priority seating reservations before full and partial season ticket plans go on sale for the general public. Membership benefits include having your name engraved onto a Founders Club plaque, which will be displayed prominently at the entrance of the stadium. In addition, new members will receive an exclusive Founders Club gift and VIP invitations to exclusive new stadium events, including the new ballpark's ribbon cutting ceremony. 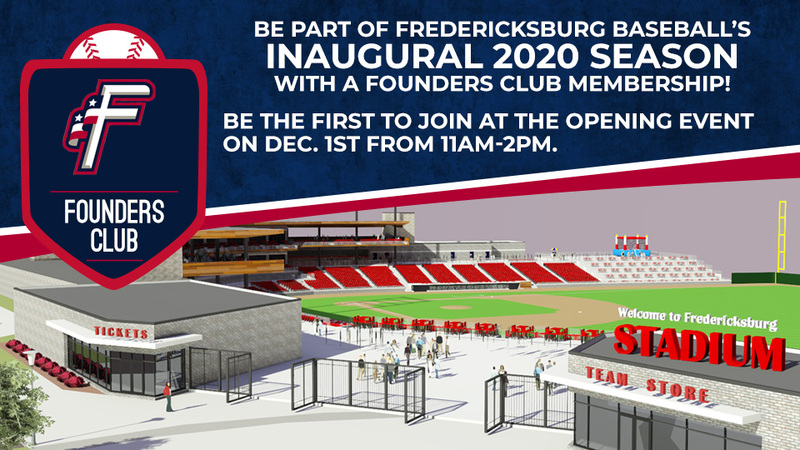 Interested Fredericksburg Baseball fans will have the opportunity to reserve their spot in the Founders Club at the organization's Opening Event on Saturday, December 1st from 11:00am to 2:00pm. The event will take place at the Fredericksburg Area Museum in historic Market Square at 907 Princess Anne Street. The first individuals to line up will have priority for seat selection at the new ballpark. Actual registrations will be accepted at noon. A $100 per seat deposit will be due upon groundbreaking in early 2019, with the further payments due upon seat selection and prior to the start of the 2020 season. Fredericksburg Baseball will continue to accept reservations for the Founders Club between December 2nd and December 31st. Founders Club benefits are only available to fans that sign up through the end of December, 2018. The Founders Club three-year commitment also locks in your ticket pricing for three years. Be part of Fredericksburg Baseball with a Founders Club membership! For more information, call 703-590-2311, e-mail fxbgfoundersclub@potomacnationals.com, or visit www.fredericksburgbaseball.com. The Founders Club membership flyer can be found here.